One of the more peculiar Princeton traditions was an exam-time ritual known as the Poler’s Recess, which began around 1900 and continued for several decades. A “poler” was a Princeton epithet for someone who was thought to study too diligently, perhaps in reference to the laborious poling of a boat. The 1949 Poler’s Recess was a rousing success, but by the following year, opinion was split as to the benefits of the event and the necessity of yet another study break, and a well-enforced ban on firecrackers further dampened enthusiasm. After a few sporadic attempts to resurrect the tradition, it faded from student memory within a few years. Historically, first year students would thank their academic parents for their guidance with a pound of raisins, although sinec the 19th century, the giving of raisins was substituted for a derivative – usually alcohol, setting the benchmark for the tradition today. Usually held annually during the last week in November (or earlier, dependent on academic calendar), first years – known as Bejants and Bejantines – are entertained by their academic parents, starting with a tea-party hosted by the academic mother and a pub crawl or house party led by the academic father. Due to the lack of stringent rules on the number of academic parents a first year may have, it is not unusual for Bejants and Bejantines to attend more than one party or pub crawl, with many families joining together towards the end of the weekend. Traditionally, the parents give their children a ‘Raisin receipt’ in return for the pound of raisins/alcohol. Throughout the years, the receipts have become more and more ludicrous, with livestock receipts banned in the 1960s after a particularly unsavoury moment involving a donkey and laxatives. …the Time Ceremony undertaken by Merton College students who in the early hours of the last Sunday in October walk backwards around the Fellows’ Quad drinking port. The purpose is to maintain the space-time continuum during the change from British Summer Time to Greenwich Meantime. Sounds pretty much like an excuse to drink more port. 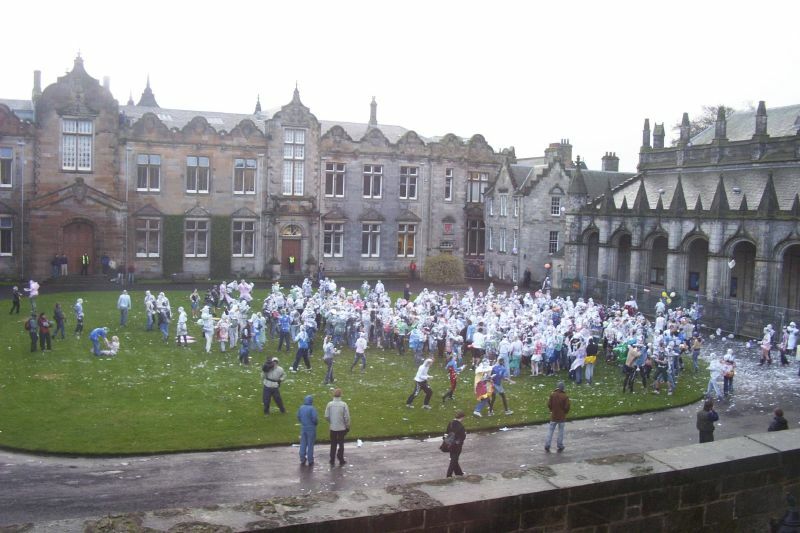 Does your institution have any similar daft traditions? This entry was posted in Community, Diversions, Education, HE, Students, University and tagged campus, Diversions, HE, Oxford, Princeton, St Andrews, Students, Telegraph, universities by Paul. Bookmark the permalink.